PREFACE: This Easter season was one of my most meaningful ever, even though I have been struggling with my health. I think perhaps that is one of the reasons it was so touching for me. God has been teaching me through this season - and its like a growth spurt. He is renewing me; mind, body and spirit and I am having to learn to seriously deal with my tension, stress and ego in a more effective way. I truly am powerless, and nothing teaches me this more clearly than having my body begin to breakdown. I wrote this article as a tribute to one of the most amazing women I have ever known. I also wrote it because reflecting on my past has really helped me learn to have a better future. Yes, its about sponsorship but it really applies to anyone who is in a position of power of others ... at work, church, home... anywhere. I think we are all sponsors in someway in our lives, even if only to our pets. Jesus was a "sponsor" of his disciples. But never forget "The Son of Man came to serve, not to be served." That makes all the difference. For as long as I can remember I have been the kind of person who had to learn from my own mistakes. I have countless memories of my father telling me not to do something just for me to go off and do it anyway. For example, he was very clear with me about how dangerous credit card debt was. He told me to never ever use a credit card unless I could pay the whole balance when it was due. He repeated this often and with passion. So what do you think I did? Yep, just like every other good American, I got myself so overloaded with credit card debt that I could barely survive. I couldn’t even make minimum payments! The best part of this lesson for me was that when I finally got out of debt… I turned around and did it to myself again. Geez. I never thought I’d say this but I want to thank the lady who rear-ended me going 60 miles per hour while I was sitting at a red light. Even though you put me through a lot of pain and 8 months of physical rehab, I am grateful because the court settlement I got was enough to pay off my second set of credit card debt. Because of you, I was able to enter my marriage with no debt at all so… thank you. Yes, I am one of those people who jumps out there in the world and tests things out, just to find out if the hype is true. I believe this “adventurous” side of me to be a positive trait, as well as a negative one. On the positive side, I’m glad I am bold and curious. I’m glad I don’t have to live in a box and just have to take everyone’s word for everything. I’m glad I have the personality to “go” and “do.” I’m glad I am not stifled by fear. I am glad this is the Wendy God created because Wendy without this wouldn’t be Wendy at all. On the negative side, having to figure everything out for myself has created a very self-reliant world for me which in turn has created a major ego problem. I’m right… don’t you know. I’m always right. Except for of course when I’m wrong but absolutely, positively refuse to admit it to anyone, even myself. This part of my personality has allowed me to continually be disrespectful to authority and to rules. This “adventuresome” part of my personality has lead me to impulsivity which has led to many, many poor decisions. The beautiful part of all of that is the way God has taken those things through the years and molded them into new understandings of who I don’t want to be. True lessons learned the hard way, but completely worth it because with my personality, I’m positive I never would have come to love and respect Jesus the way I do now by any other means. I HAD to screw up so I could see the miracle of His love in action in my own life. Just being told of His love, wouldn’t have ever been enough. Getting sober was obviously one of those tough lessons. To get sober, I had to let go of my ego so I could stop saying my favorite two words, “I know.” I had to humble myself and admit… I don’t know anything. Walking around admitting I knew nothing turned out to be a lot easier than the other way. It turned out to be freedom. When that day came for me… I was ready! At least my ego was ready, but not much of the rest of me was. I said yes, of course. I had been warned to be very careful about sponsoring others. I was told that sponsoring before I was ready could put my own recovery in backward motion. I was told to never sponsor unless I myself was actively being sponsored, and sponsored well. I was also told that one of the most dangerous things I could ever do is sponsor others when I wasn't humble. A sponsor with extreme ego can be likened to a crazy dictator. The two most likely results of this bad scenario are 1) the "followers" being brainwashed into believing the "leader" is some sort of god. This is an egomaniacs lifelong goal, you know, but... hello first commandment... or... 2) the "followers" grow tired of being treated like brainwashed-morons and organize a complete revolt against the "leader" followed by a "burn-her-at-the-stake" ceremony. Neither of those seem like very good results. But as usual, I didn’t think these warnings applied to me. I had this figured out (a whole year into sobriety LOL) and I was going to be fine. I would like to clearly state that all of the warnings were correct... all of them were true... and I hate that I had to again learn this the hard way... but learning them this way has made them stick. And I constantly get to remind myself that God is big enough to fix my screw ups. He always has someone else to send, it doesn't always have to be me. My first sponsorship didn’t last very long, only about a month. My sponsee went back out to drinking and I just knew, it was all my fault. If only I had done a better job, if only I had been there for her more, if only I had said the right things or done more for her… she’d still be sober. I vowed I had to do better the next time. I wasn't going to let another sobriety be broken, not on my watch!!! Hello ego! Sponsee number two came along and we worked together for about 6 months and from what I saw, I thought it was going great. I was telling her exactly what to do, I was making sure she was doing it, I was on top of all the ifs and or buts and I was in her business and working hard. I wasn’t going let this one go. I taught her the way I had done this sobriety thing and that was the gospel. 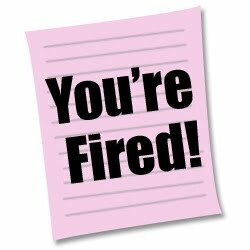 I was shocked the day she handed me my sponsor pink slip… FIRED. It was like being blind-sided at a Survivor tribal counsel. Being voted out by my peer was painful. Upon reflection, I realized I wasn’t giving her any freedom to work recovery the way she needed to work it. I had believed my way was the only way. I realized I was wrong. I realized I wasn’t mature enough in my own recovery to do this job and do it well so I decided not to try again for awhile. A year later, I sponsored someone briefly but that ended purely because they couldn't get passed the first step. They couldn't admit they were powerless and that God was really the one in control so I didn't even try fight it. I let God have that one and I walked away. I have no idea how that worked out. Another year later, I allowed myself to try again when I was asked to sponsor three different ladies. I had grown a lot and felt I had my ego in check. Since I was sure I had learned from my mistakes, taking on three at once was going to be just fine. I honestly think I did a pretty darn good job with all of them. I feel like I let them go at their own speed, let them figure things out by simply asking questions instead of telling them the way it was. I feel I let them experience what they needed to experience in their own time. I feel like I did as well as I could have for where I was in my own recovery and quite frankly, I had a lot of recovery knowledge to share so it was all working out well. I did however make a different but crucial error. I became very close friends with all three of these ladies and thus became involved in a codependent relationship with each of them. I enjoyed being needed, I enjoyed being relied on and as a result of those feelings, my ego began to show up. Ultimately my lack of boundaries in our relationships blurred the lines between sponsor and friend so badly that I was unable to effectively be either. The friend in me lacked empathy because she always sounded like a sponsor and the sponsor in me wasn’t able to push growth because she sounded too much like a friend. Once I realized this, I gave myself the sponsor pink-slip. Just for the record, firing myself only felt a little bit better than being fired. I learned a lot from all three of these ladies and I am so thankful for the experiences. I’m thankful they are all still in my life. In October of 2010, I met a young lady who transplanted here to Texas from the mid-west. I had an immediate Godly love for her. When she asked me to be her sponsor, I was scared to say yes but something inside me allowed me to go forward. I didn’t want to mess it up for her. She was fresh and young and seemed to want a new sober life so badly. I didn’t want my failing, ego, immaturity or codependency to get in the way of what she was searching for. So, I looked back at the things I hadn’t done very well in the way I had sponsored, my sponsor-slips, and I took them to heart. I asked God to help me be better at this. I asked Him to show me the way. It’s funny, here I sit typing seven months later and she hasn’t fired me as her sponsor yet. There have been some rocky times for her, and for me but I believe God has given me exactly what I have needed to let her be exactly who she has needed to be this entire time. In the last 3 months, she has soared. Recovery has finally really stuck to her. God has made His way into her soul and He resides there permanently now. She is hungry for this new life. She works hard, she listens, she asks questions, she is obedient, she is tenacious, she is painfully honest with herself, and she isn’t doing any of this for me… she is doing it for Him. She is AMAZING! I was lying in bed and realized that sponsoring her has been the easiest sponsorship I have ever experienced. It has also been the most rewarding AND the one I have grown the most as a result of. I realized there was one simple reason for all of that. She wants recovery for herself so badly that I don’t have to want it for her. I do want it for her, but I don’t carry that responsibility around with me all day. She recognizes that her recovery is her job and she takes full responsibility for it. This is the way it’s supposed to be! The sponsor isn’t supposed to try to work the sponsee’s program for them… the sponsor’s job is to merely work their own program. Letting her be responsible for her recovery allows me to be responsible for mine. There is no codependency. There is no ego. I have finally gotten it right. Now that’s not to say I always do things right in our relationship, but it’s the most right I’ve gotten it so far. I am so very proud of her for her dedication and growth. She is amazing. She reminds me of myself way back in the beginning when I allowed myself to be humble and painfully honest with myself. I feel like I am learning to be that way again because of her example. I am growing so much because of her and I hope she knows that she is a superstar! Never have I seen anyone grow in Christ the way she has. Thank you Jesus! My prayer for her is that when the day comes and those 5 words are said to her… “Will you be my sponsor?”, that she will humbly say yes, she will let others be exactly who they are and let them find their own way and that she will never, ever want recovery for someone else more than they want it for themselves. But most importantly, I pray she never stops working her own program to work someone else's for them. I know her pretty well though and I don’t think any of those things will be a problem for her. She isn’t quite the ego-maniac I am. Thank you for all you have taught me. You are a true blessing to me and to the world.